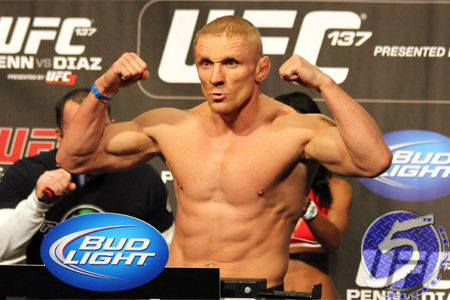 On Thursday, the Nevada State Athletic Commission suspended UFC featherweight Dennis Siver (pictured) nine months and fined him $19,800 for testing positive for hCG (Human Chorionic Gonadrotropin) following UFC 168. Yeah, about that win. It was also overturned to a no contest. After December’s unanimous decision victory over Manny Gamburyan, Siver’s A-Sample provided “inconclusive” results. His B-Sample returned with traces of hCG, a banned substance with the Nevada State Athletic Commission. Siver blamed his unnamed nutritionist for recommending the undisclosed dietary supplement he consumed that caused him to flunk his exam. The 35-year-old is eligible to return to action on September 28.